How about a pot of chili to warm the soul on a cold winter day? Let the chili simmer in a slow cooker all afternoon with as the aromas fill the kitchen. This recipe has become a family favorite. I have several favorite chili recipes. 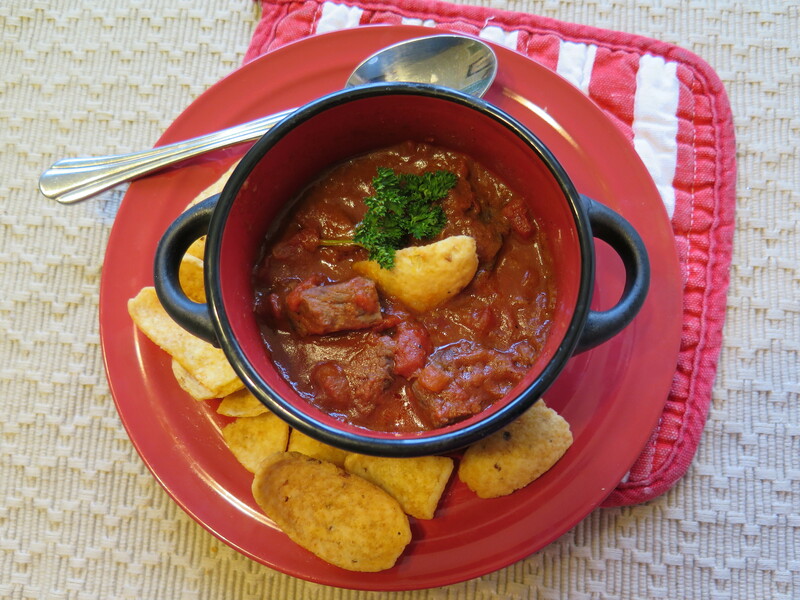 This one is great for a slow cooker because it is made with cubes of beef chuck. 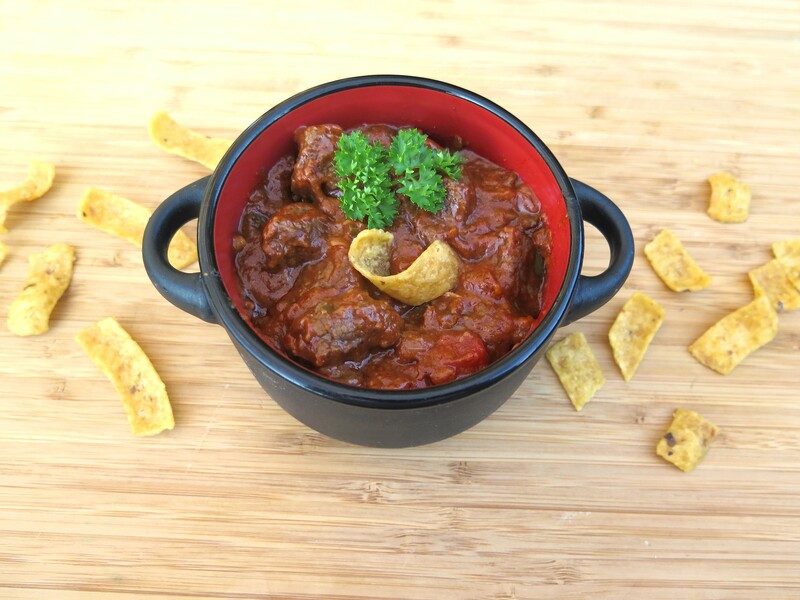 This cut of beef needs slow, moist heat to make a tender meat and flavorful chili. I make a big pot and it lasts for several days–or I freeze the leftovers. The recipe is easy to make. Saute the beef cubes and seasoning vegetables (onions, bell peppers, Serrano pepper and garlic); then everything is added to the slow cooker and the chili cooks with very little attention all afternoon. Our family likes to eat the chili with corn chips or rice. Sometimes I’ll purchase beef cubes for stew already cut up. I prefer beef chuck rather than beef round or sirloin tips because they are more tender and flavorful. This time I cut the beef chuck into cubes myself. This way you can trim off excess fat. Here are the beef cubes on my kitchen-handy Martha Stewart scale (from Macy’s). It has turned out to be a very practical and usable kitchen scale. I coat the beef cubes in seasoned flour (salt, garlic powder and pepper) and saute them on the stove in several batches to seal in the flavors. The flour also thickens the chili making a smooth gravy. I use a heavy Teflon-coated iron skillet that is great for this task. After the beef cubes are sauteed, I cook the finely chopped onions, bell pepper, Serrano pepper (seeded) and garlic until the onions are translucent. This helps dissipate the raw flavor of the onions. Other ingredients are canned diced tomatoes, tomato paste, either canned beef consomme or beef broth and good quality chili powder, a little cumin. 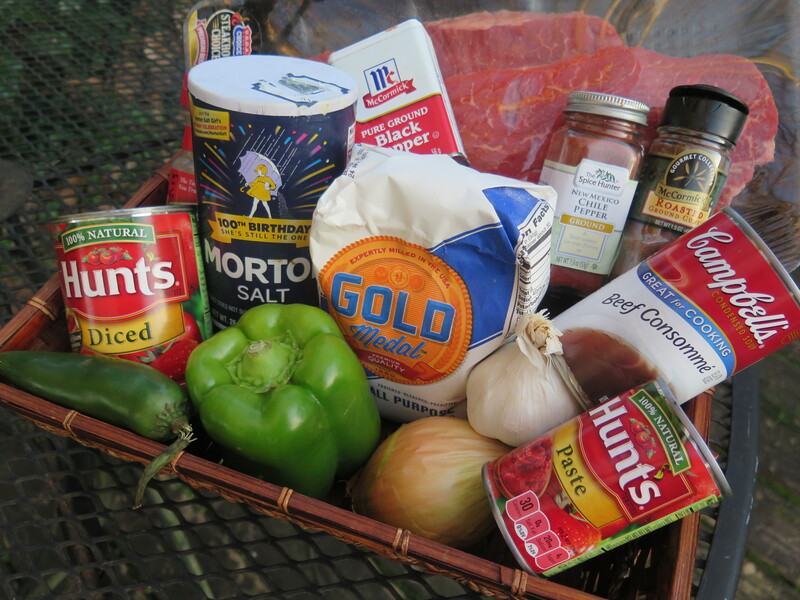 This chili doesn’t have any canned beans–you can always add these if desired. I’ve tried various combinations of beef, tomatoes and beef broth. These proportions work; but it’s a flexible recipe and other ingredients can be substituted such as canned whole tomatoes, tomato sauce. Usually I’ll use canned beef broth but this time had canned beef consomme on hand; these have plenty of sodium so extra salt is not needed in the chili. 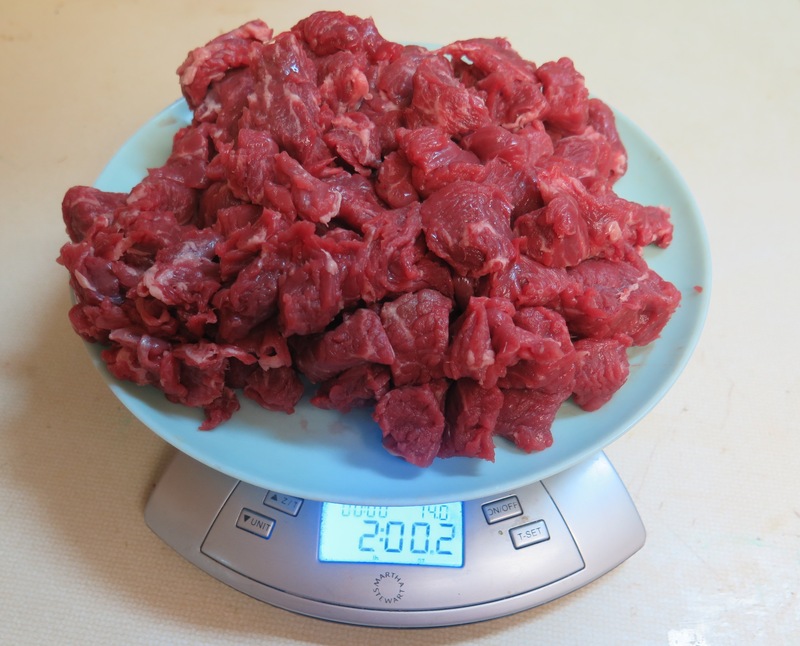 About 1 1/2 to 2 pounds of beef cubes make a meaty chili. I chop the seasoning vegetables-onion, peppers, garlic–very finely with a knife or food processor. They are exactly that–seasonings–and don’t need to be distinguishable in the finished chili. The Serrano pepper can be omitted for a milder chili. For slow cookers, I use a large slow cooker which has a greater surface area. I feel more comfortable getting the meat and other ingredients to a high temperature more quickly. Then, I will sometimes turn the heat to low at the end of the cooking period. Also, I rarely leave my house with a slow cooker going–guess I’m just a safety minded person. 2 garlic cloves, finely minced. Combine the flour, salt, garlic powder and black pepper in medium bowl. Add about 2 tbsp oil to heavy skillet to cover bottom of skillet on medium high heat. 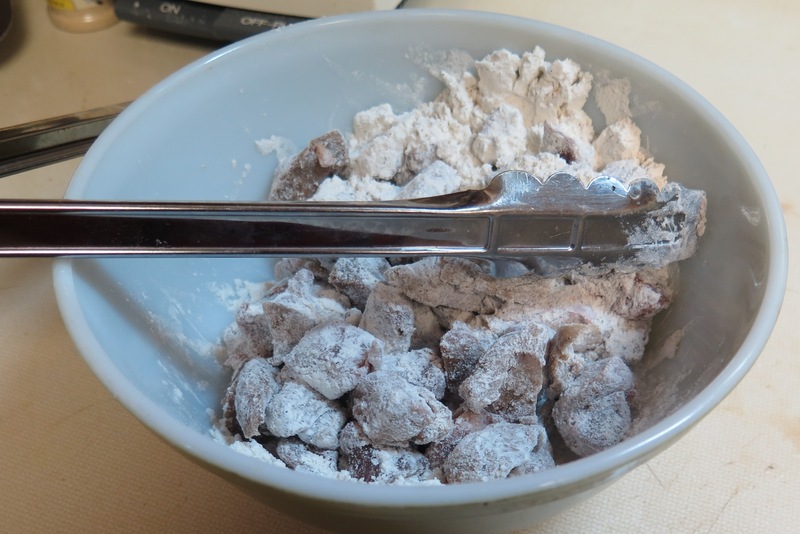 Add the beef cubes to the seasoned flour in batches (about 1/3 to 1/2 of the beef cubes). Coat with flour and shake off excess flour. Place the coated beef cubes in hot oil in skillet and cook until browned on one side. Turn cubes over, using a spatula or tongs, and brown on the other side. Remove and place in slow cooker. Add additional oil to skillet, and repeat with additional batches of flour-coated beef cubes until all the beef is browned. Turn heat to medium, remove as many beef drippings as possible and add to slow cooker. Add 1 Tbsp oil to skillet, add onions and saute 5 minutes. Add bell pepper, Serrano pepper, garlic and cook about 5 additional minutes until the onions are translucent. Transfer to meat in slow cooker. Add the canned tomatoes, tomato paste, beef consomme plus water (or beef broth), chili powder, cumin and pepper to slow cooker. Stir well to combine all ingredients. Cover slow cooker with lid, turn heat setting to high and cook for 2 hours. Stir occasionally. If desired, cook additional hour on low setting of slow cooker. Serve with corn chips or rice. Why the corn chips? This is how chili is served in the public schools in Louisiana so my kids got used to it. Try it, the crunchy chips taste great with chili. Enjoy! 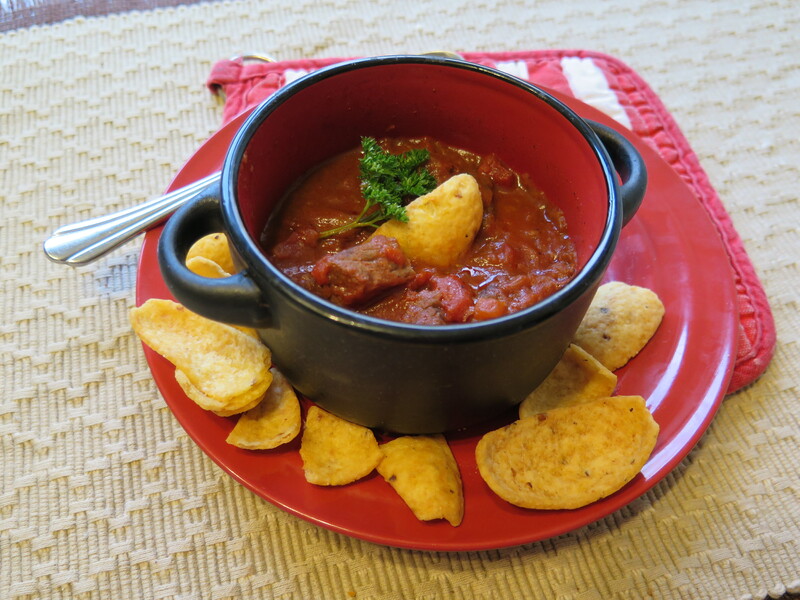 This entry was posted in Recipes and tagged beefy chili, easy chili recipes, slow cooker recipes by Maylee at Beyond Gumbo. Bookmark the permalink.